No one starts trends quite like Miuccia Prada, and ever since she created pyjama sets with feather trims and feather-covered pumps in the spring/summer 2017 collection, this has been a party detail you can count on. Because what is more fun than a pair of Barbie-pink satin mules covered in fluff or a trouser suit with feathered cuffs? This party season everything from mules to trousers to handbags have been given the feather treatment. Many of the cult brands on Instagram are into the feather trend this season, including Staud, Magda Butrym, Attico and Sleeper. On the high street, we love Topshop's feather mules which come in black and burgundy, and Uterqüe's baby-pink camisole with a feather trim along the neckline. We have a feeling you're going to see as many feathers as sequins at your office Christmas party this year. Keep scrolling to see how to wear feathers, and shop our edit of the best feathered pieces. 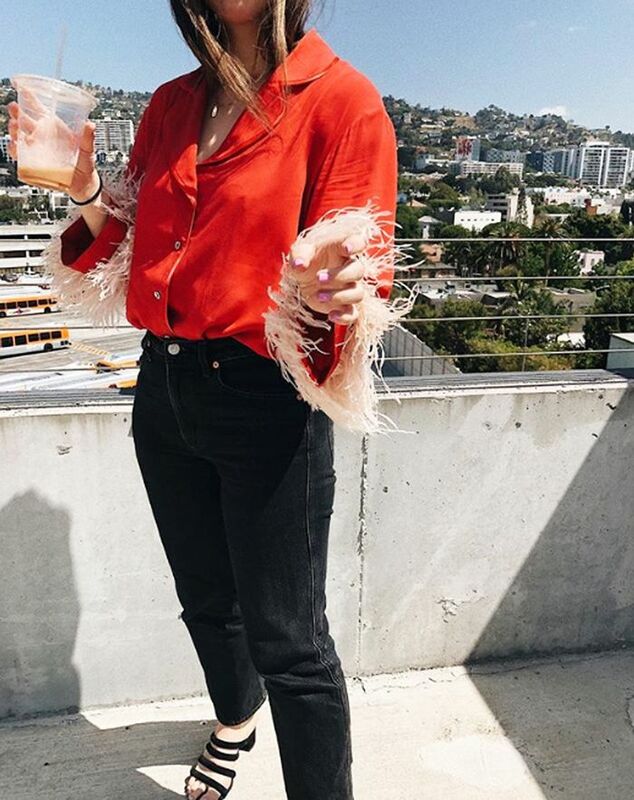 Style Notes:Who What Wear's Lauren Eggersten wears a Sleeper red pyjama shirt with feathered cuffs with a classic pair of black straight-leg jeans. Style Notes: Who What Wear UK's Hannah Almassi wears her black feather trousers (hers are from Kitri) with an oversized grey cardigan—showing you can wear these statement pieces in the day too. Style Notes: Gilda Ambrosio shows you can even wear two feathered items at once. Style Notes: Staud's feather-trimmed handbag looks amazing when paired with a pastel minidress. Next up, see our guide to the key dos and don'ts of party dressing.